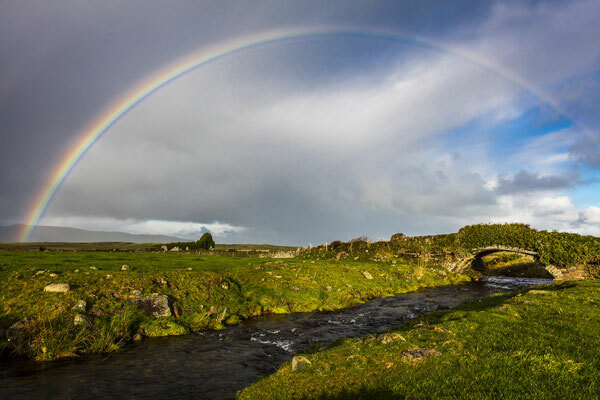 You've got to love Ireland - if you've ever been to the Emerald isle you'll know what we mean and agree: Nowhere else offers such a welcoming, friendly crowd of people, who'll greet you in the friendliest way, no matter if you meet them in the line-up, at the beach or in the pub after your session. The nature and overall scenery is sheer breathtaking and last but not least: These incredible conditions on the water, the waves, the power..! Everyone who hasn't been: Check out the video below to get an idea of what to expect. After years of talking about it, it was in fall 2015 that everything finally just came together: We were able combine Mark&Sanja's local knowledge with Marc's clincs to offer a guided tour and an intensive wave coaching for kiting in waves at the westcoast of Ireland. And as customers, coach and organizers enjoyed the trip alike we decided to continue offering Irish venues - held in English. 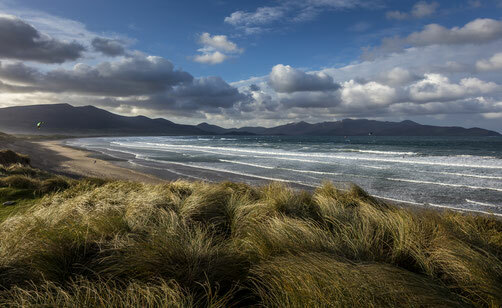 Join us from 12th to 19th of April 2019 for an intensive wave coaching in the Brandon Bay. 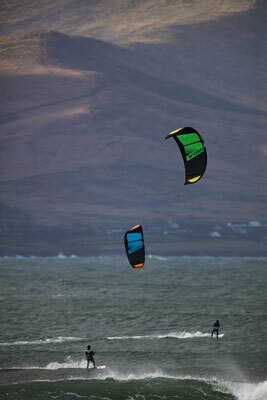 We'll be at home in a house overlooking the bay and footsteps away from the beach for the intensive wave riding clinic. The coaching implements live support on the water with instant feedback, theory sessions and daily video analysis to help you to focusing on the small and big mistakes you're doing - as well as help your general progression. While conditions and spots in Ireland are amazing - they are also fickle. Ireland has massive tides and it is not rare that a spot that used to work great a year ago isn't working at all a year later. To be at the right place at the right time we're happy to be able to rely on a crew of locals who know every part of the island and leave no wave unridden. Find below right a video as an example of what Marcs team mates on the island there are up to. 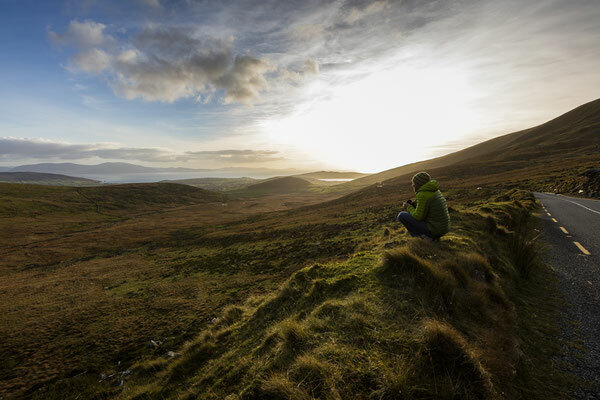 Ireland is pure nature. 4,5 million inhabitants, of which more than a quarter are living in the three big cities - there sure remains a lot of uninhabited space near the coasts. 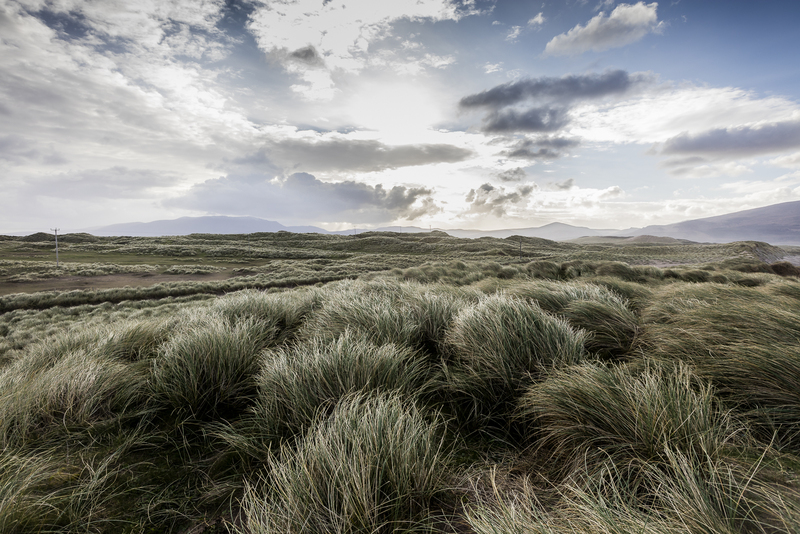 It's pure, it gives you space to breathe, it's idyllic. And these sensational kitesurfing and surf conditions only add to that. 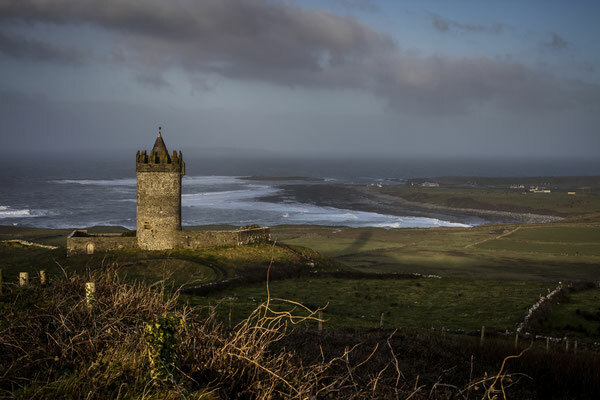 Due to it's exposed location, Ireland is prone to profit of nearly every low pressure system brewing up over the Atlantic ocean, bringing wind and waves to the island. 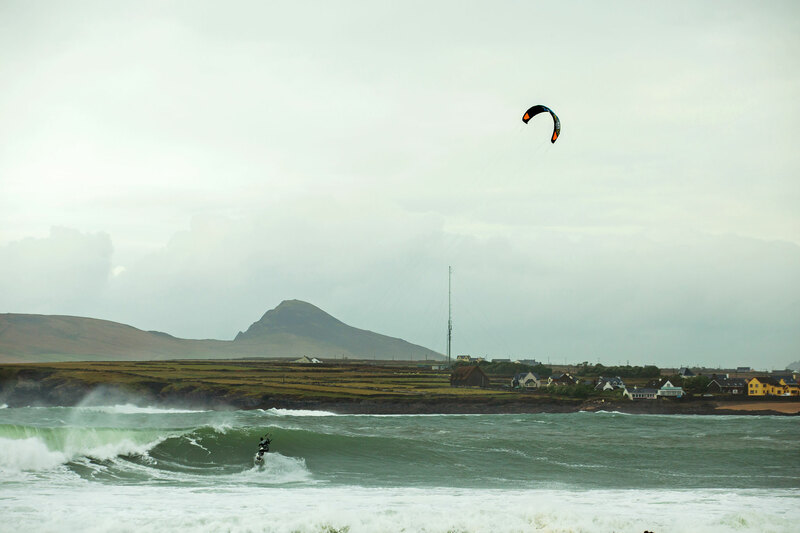 This makes it a fairly reliable destination for surfers and kiters in the winter months. The Gulfstream on the other hand ensures water temperatures in the double digits - even in the middle of winter. 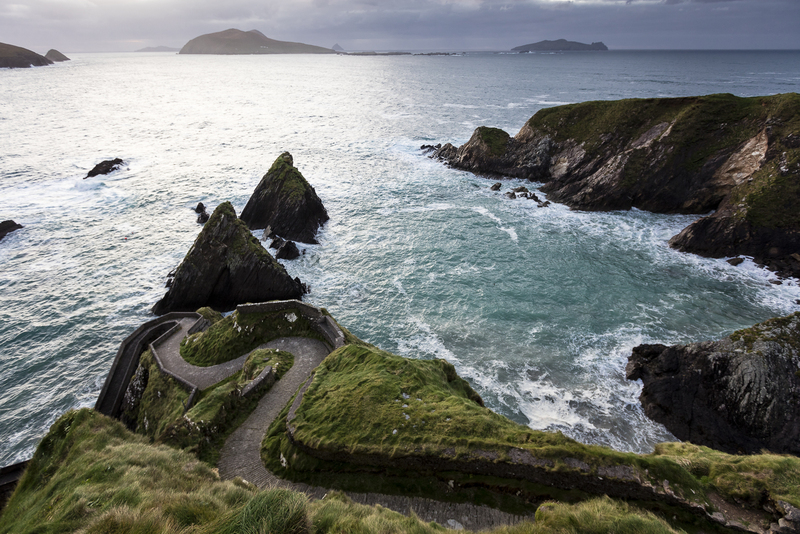 The "wild atlantic way" covers more than 2500km of Atlantic coastline and offers a sheer endless variety of spots. Whether it's the 13km long beach of the Brandon Bay, in County Kerry, the reefs in County Clare and Sligo or beach and reef brakes near Belmullet - the spots are the top of the crop - and we just have to decide which one to pick. 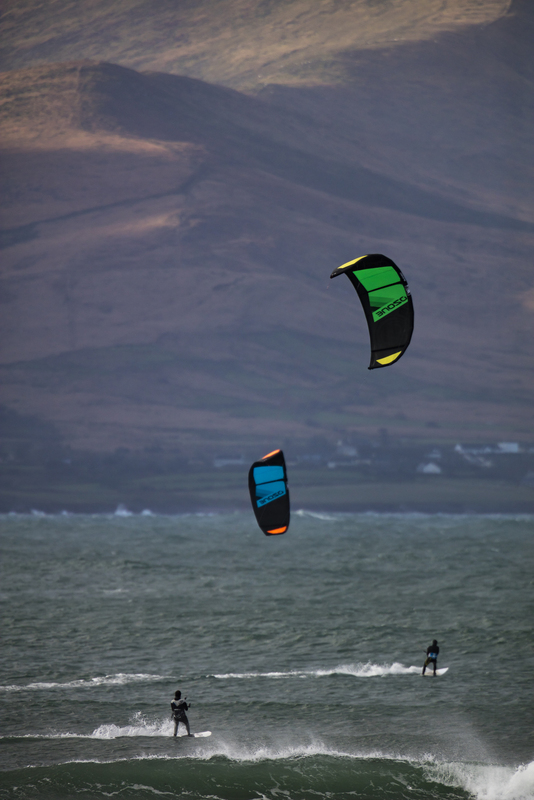 It'll be nearly impossible not to find a perfectly suited kitespot for waveriding in Ireland in April. 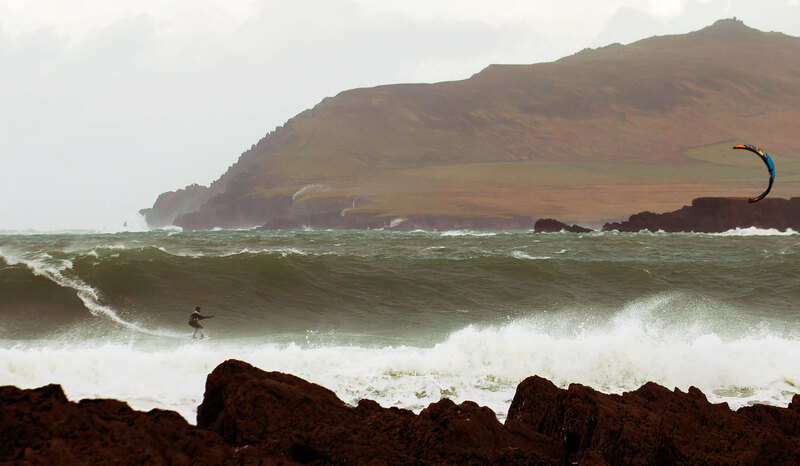 If you'd like to get an impression of Ireland in winter check out the masterpiece of Irish moviemaking "Dark side of the lens" by surf-cineast Mickey Smith. Talking about the weather.. Well, there is a chance it might rain the odd time. But without rain there would neither be these amazing clouds in the sky, nor the famous "40 shades of green" or these happy sheep. And generally the showers at the west coast leave as quickly as they come. The weather is extremely changeable. Lashing rain sideways followed by blue, blue skies and sunshine - everything's possible in Ireland. The temperatures are almost always above freezing, even in the deepest of winter. Normally it's even much warmer. Due to the gulf stream the water remains at a totally doable 10 degrees until December. A well fitting wetsuit, a hood, booties and gloves should be in your baggage though - it's always better to be overequipped. In regards wind you'll be well of if you pack a quiver of kites ranging from 6 to 10 m2 in sizes. 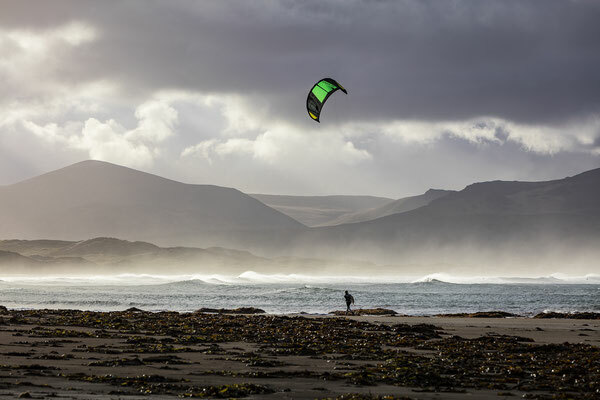 REQUIRED LEVEL OF KITING: You need to be fairly comfortable riding a surfboard, and competent enough to safely get in and out of the water also in rougher conditions. Some experiences with waves is good to have. 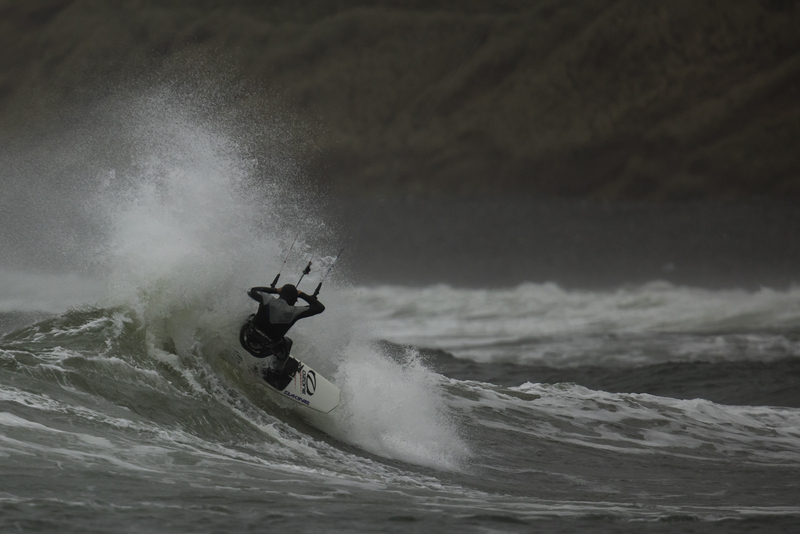 The main subject is to work on your wave riding skills, understand and get to apply the individual aspects of it, learn to put it all back together and adapt your riding to different conditions and locations. The journey to the island is being booked individually. Nevertheless we are happy to help you with that. It is faily easy and inexpensive to travel to Ireland. 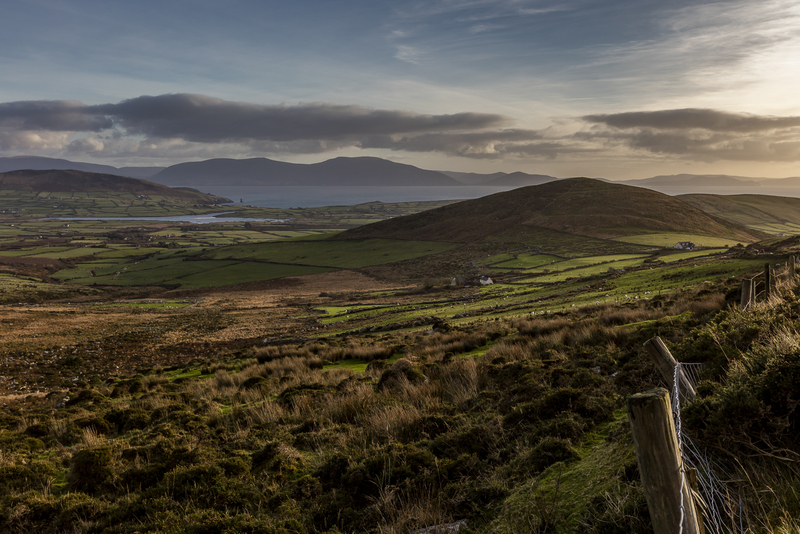 The flight takes around 1.5 hours and Ryanair and Aerlingus fly from several airports for around 100,- Euro. Surf luggage is between 35,- and 50,- one way, depending on the carrier. Rental cars are relatively cheap: You can get a small car from 70,- for a week including insurance. If you need ideas where to book just get in touch. 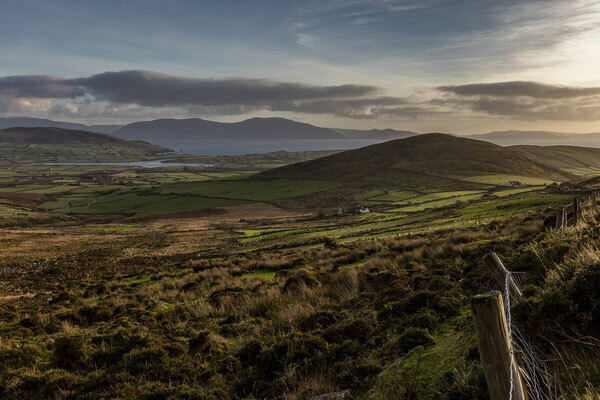 If you, however prefer to travel with your own van to extend the trip by a few days it's not very expensive either: The ferry from Cherbourg in France to Rosslare in Ireland is around 95,- Euro one way. The general cost of living is slightly higher than for example in Germany. We will arrange housing for the group. Hopefully all of us will stay in one big house - depending on the spot it might be necessary to stay in B&B's. 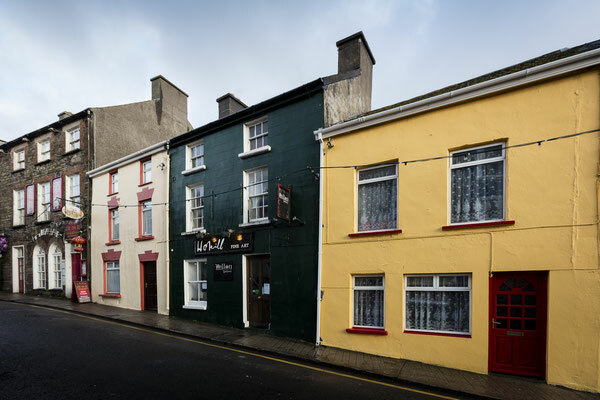 Expect approximately 35,- Euro per person sharing a room per night. If you have any further questions - or if you have decided to participatejust get in touch with us via the Booking link below. Please note that we have done everything in order to maximize the chances to catch the best conditions for you. However we are not in control of the weather and there will be no refunds due to lack of wind. We'll be, in such case, able to adapt and more emphasize on land-based instructions, making sure you do go home with an increased knowledge how to improve your riding.